1 / 4 — Dual containment piping. 2 / 4 — Outside view of the USGS building. 3 / 4 — Underground dual containment piping within a laboratory room. 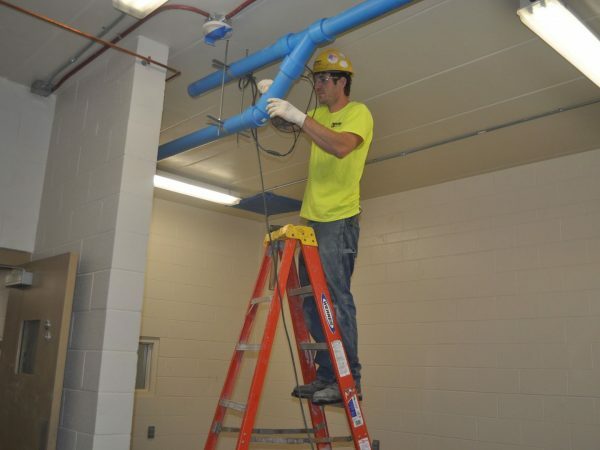 4 / 4 — Installation of overhead vacuum piping. The United States Geological Survey National Wildlife Health Center resides in Madison and investigates outbreaks of wildlife diseases nationwide. 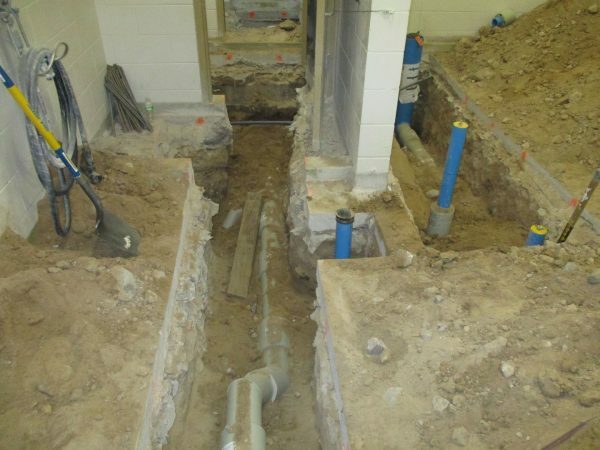 The building’s cast iron underground plumbing system had become rotted and deteriorated, but doing a direct replacement was not feasible due to the size of the system and its location beneath the building. Hooper was thrilled to serve as the general contractor on this job and install an alternative solution. 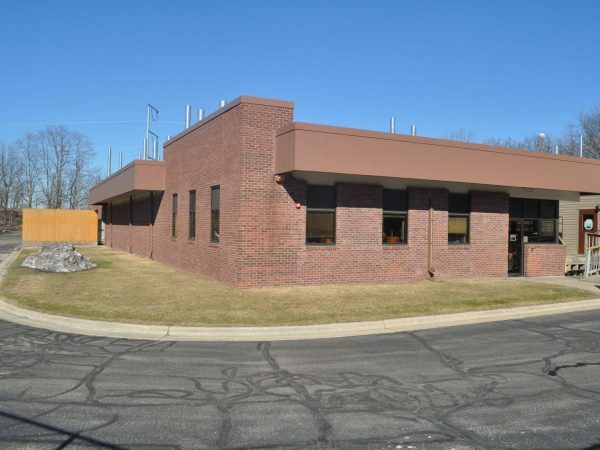 A vacuum system was engineered to take the waste overhead from the laboratory rooms back to a central vacuum center located in a new mechanical room. The backbone of this project is the vacuum system utilized to extract waste overhead from 26 laboratory room locations. The vacuum system is not an everyday installation. Training, coordination, and plumbing crew talent was required to create a fully functional system. The vacuum system consists of accumulators within the laboratory rooms, overhead piping system, collection tanks in the mechanical room, a triplex-vacuum pump center, strainers, high efficiency particulate air (HEPA) filters and many other components. Portions of gravity drainage and pressurized pump discharge are also incorporated into the system. The nature of the waste on this project determined much of the piping system be dual containment as a safety precaution. 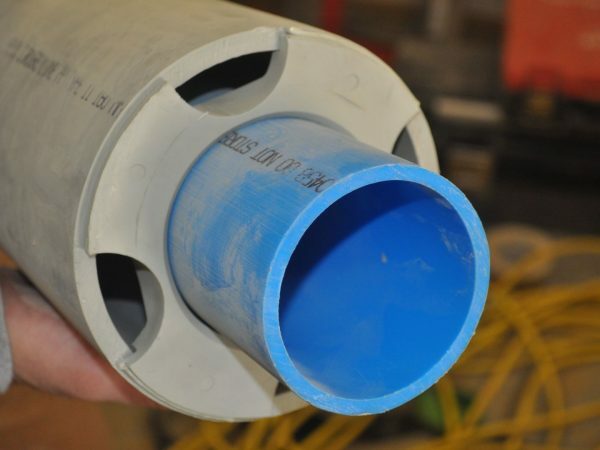 Dual containment piping takes much pre-planning, forethought, and labor for a successful installation. Fabrication drawings of the dual containment piping assemblies were created and sent to the manufacturer for creation. The complex and cumbersome assemblies were then pieced together in the field to complete the system. HEPA filtration is also utilized at many points in this system as a means of air filtration. This project incorporates many systems and components not typically found on the traditional gravity drainage system. A new complete epoxy flooring system will be installed to conclude this project and give the owner a brand new floor surface. Hooper, with the help of its subcontractors, is on track to complete this complex project on time to give the owner continued use of this facility for many years.